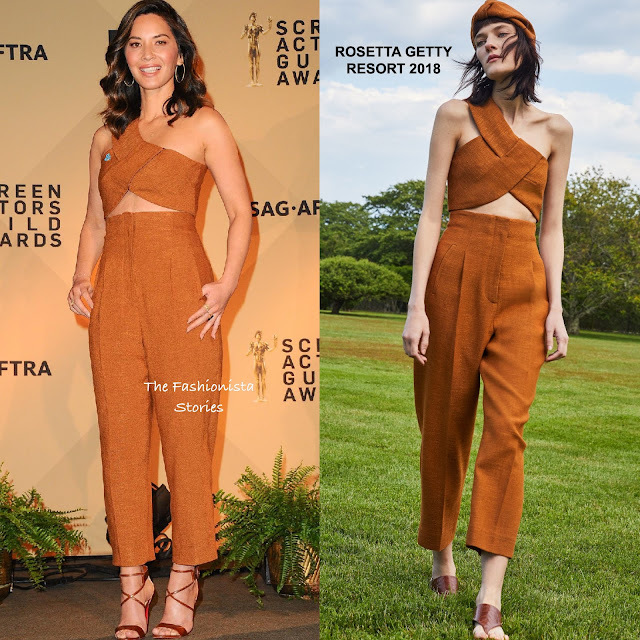 The 2018 SAG awards takes place on January 21, 2018 and yesterday morning(December 13th) Olivia Munn was on hand for the nominations announcements in LA. For the occasion, she showed a little of her midriff wearing a ROSETTA GETTY RESORT 2018 tobacco asymmetrical crop top with the matching high rise, crop trousers. I like this chic ensemble which she styled with CHRISTIAN LOUBOUTIN strappy sandals. Side parted waves, minimal make-up and gold hoops.